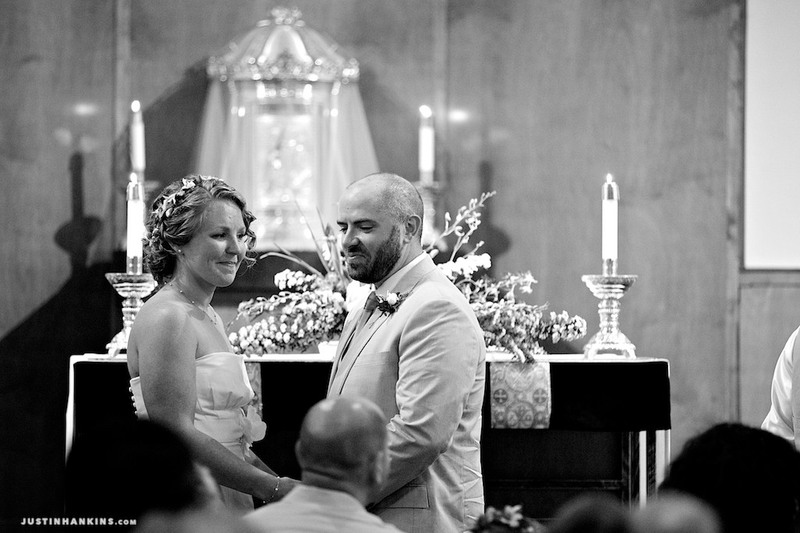 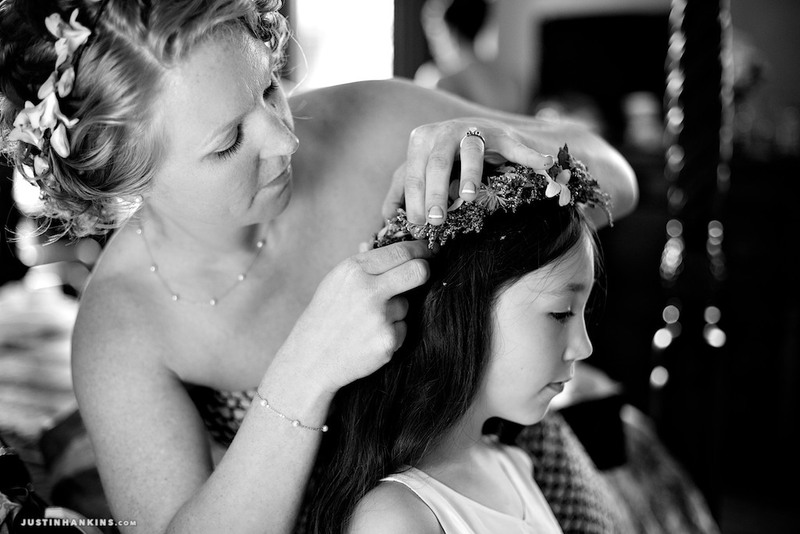 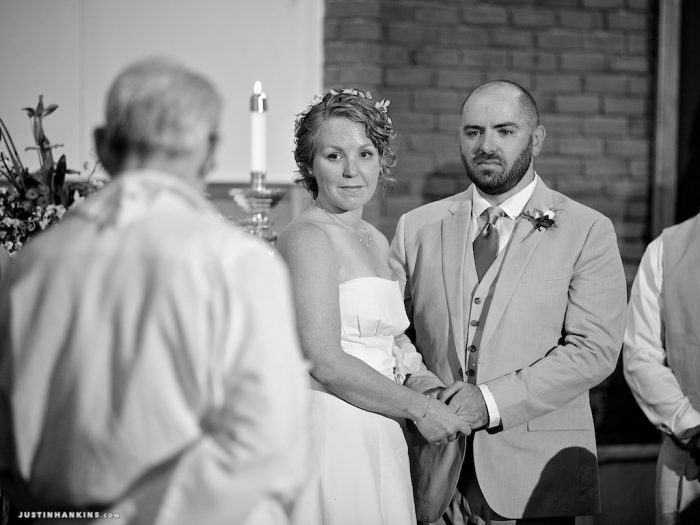 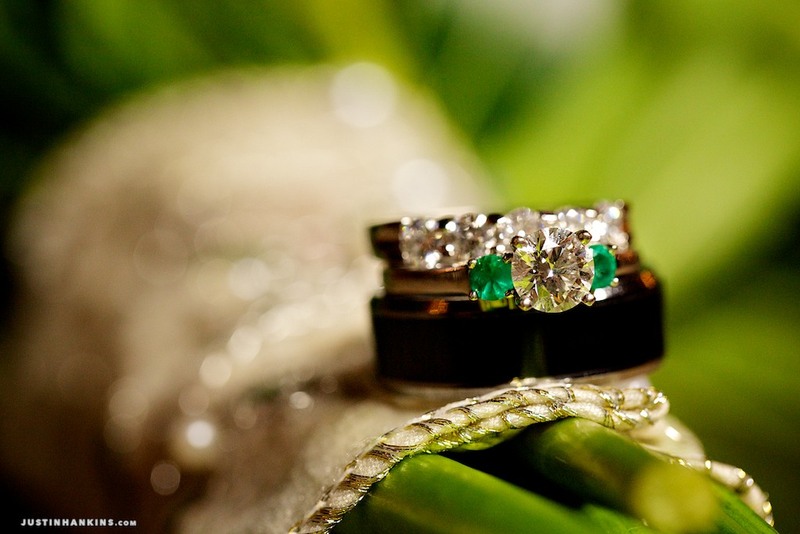 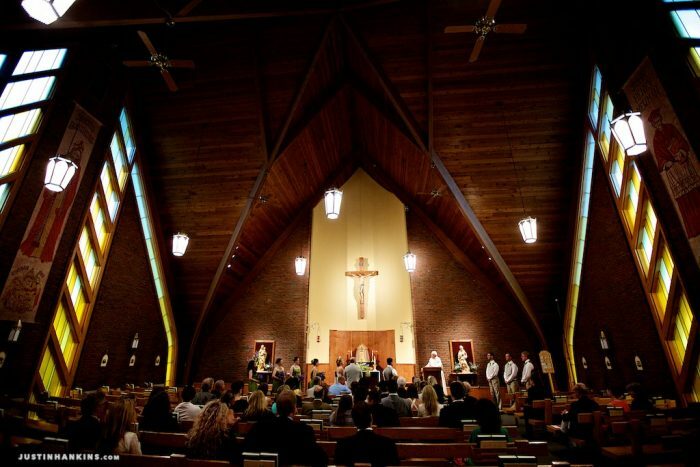 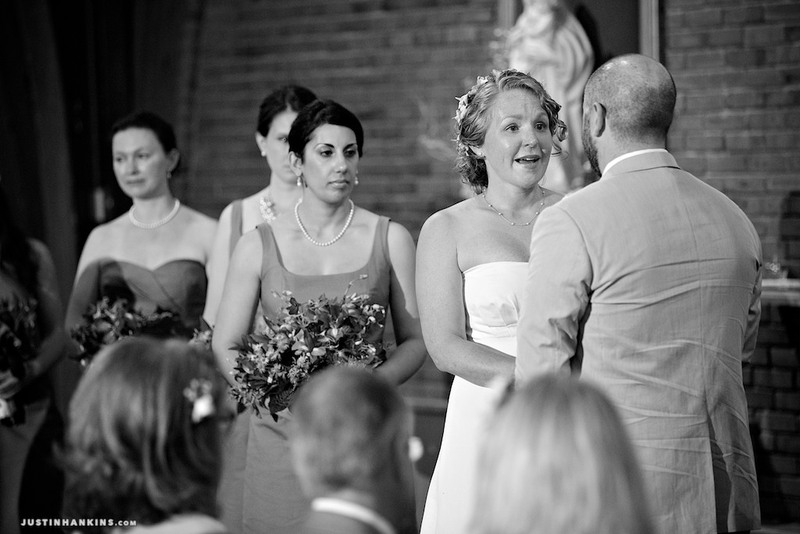 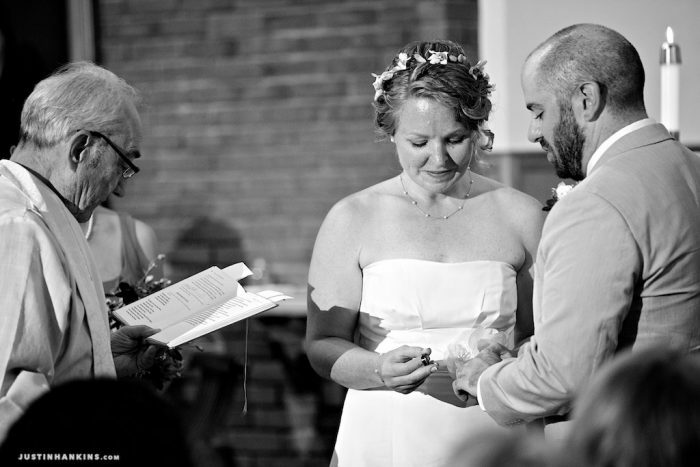 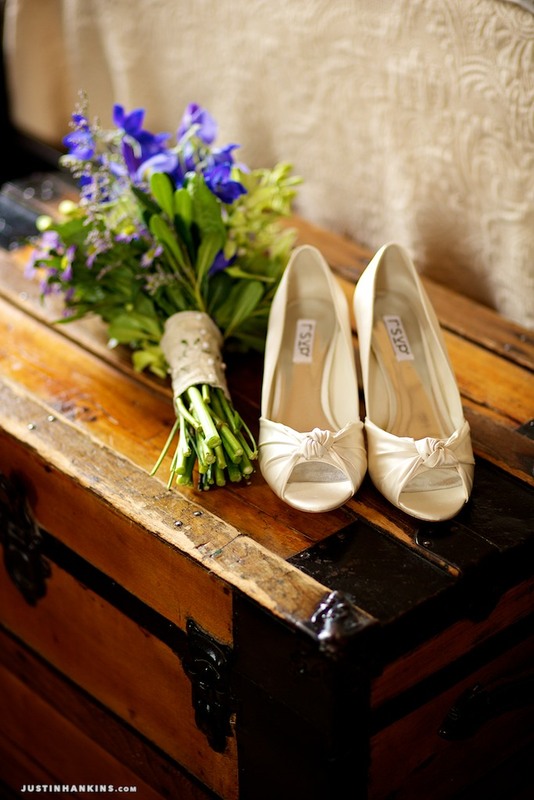 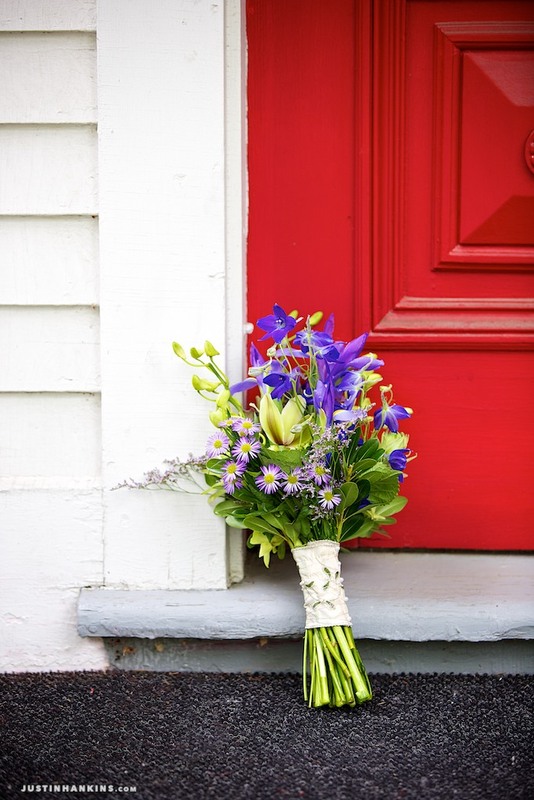 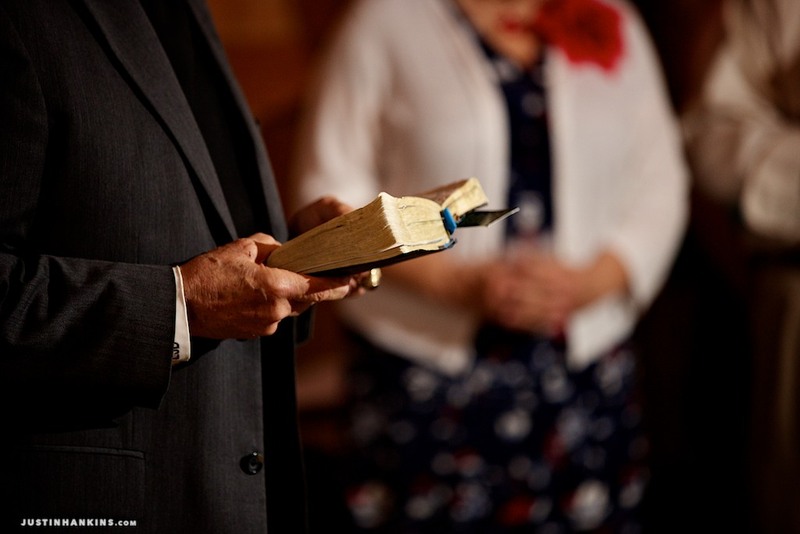 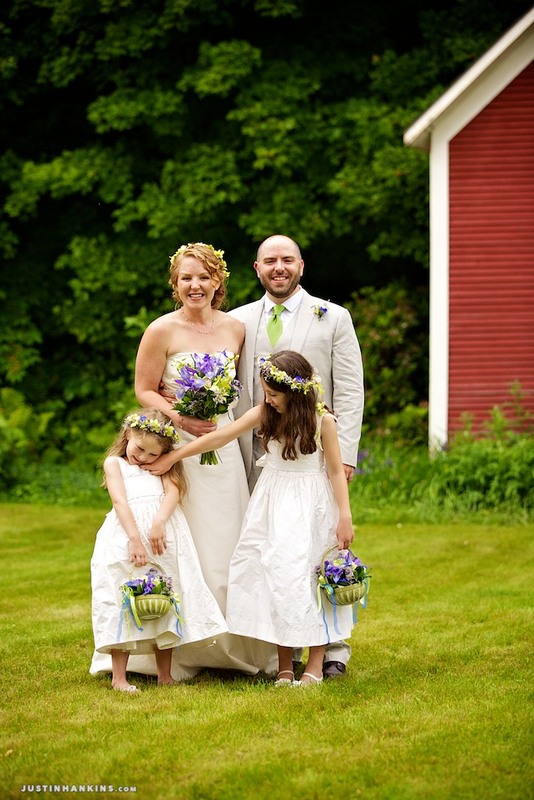 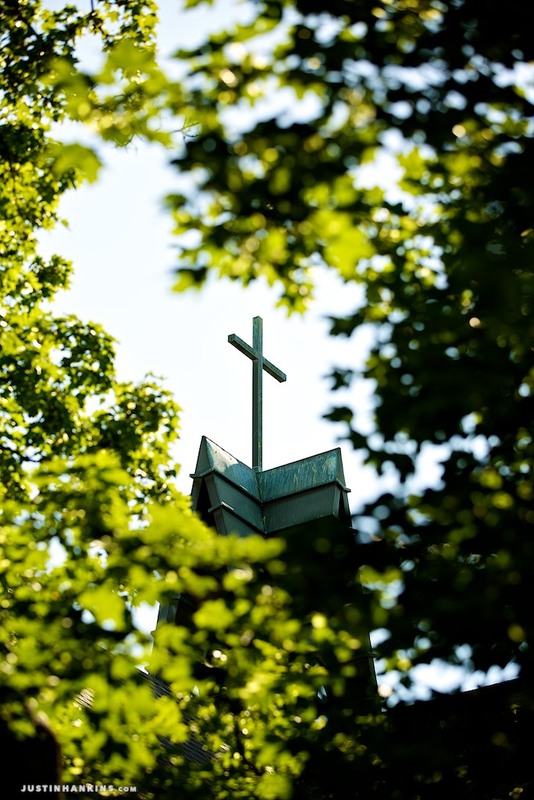 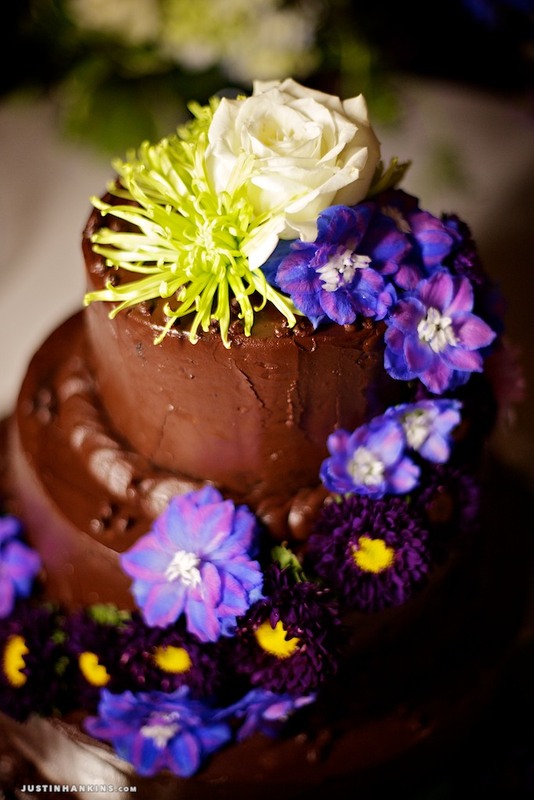 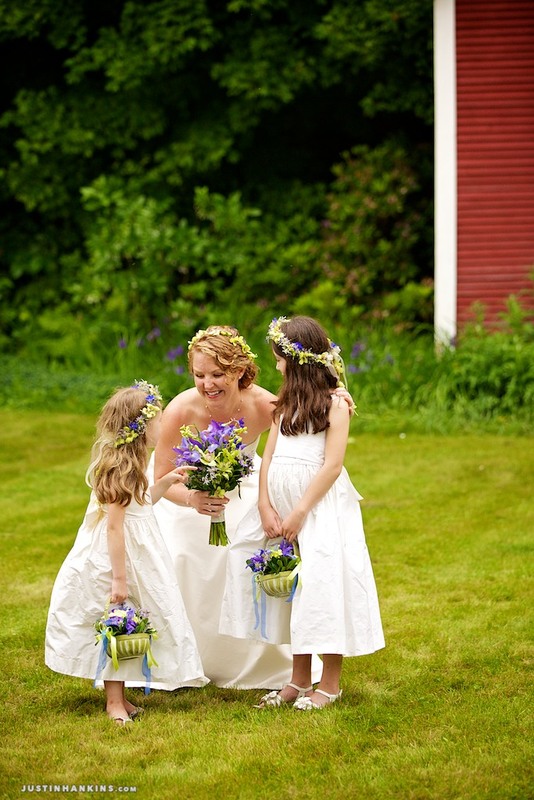 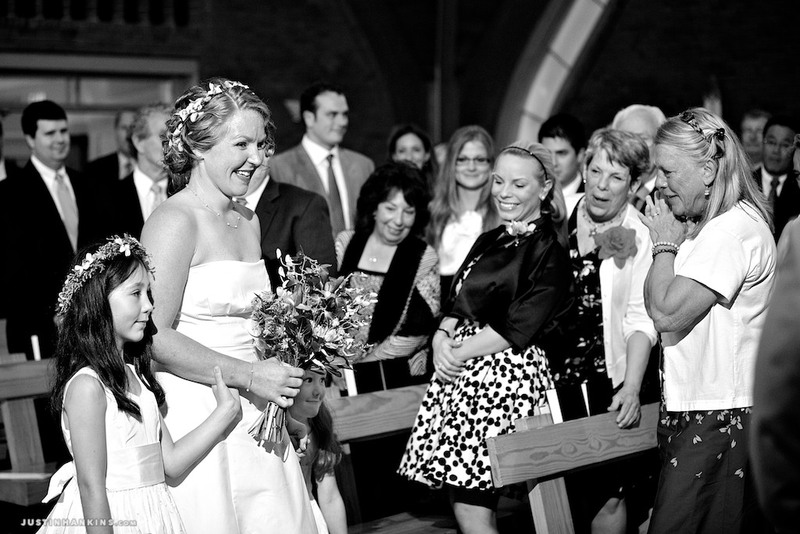 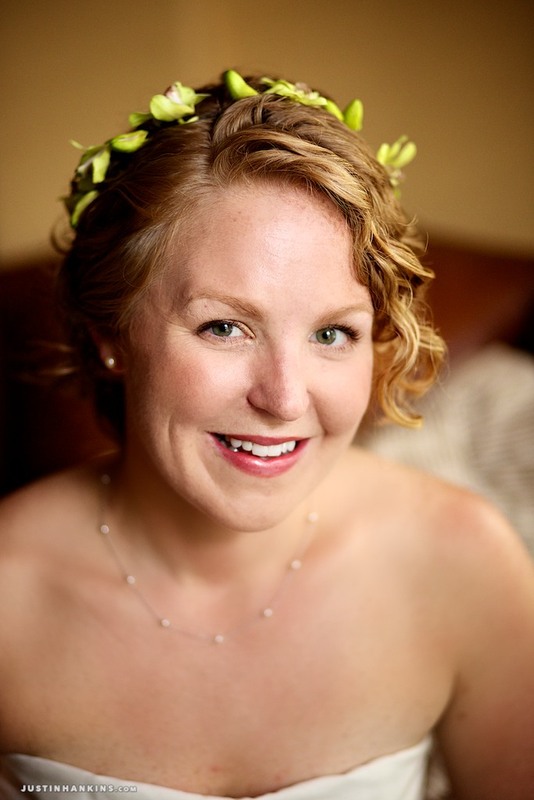 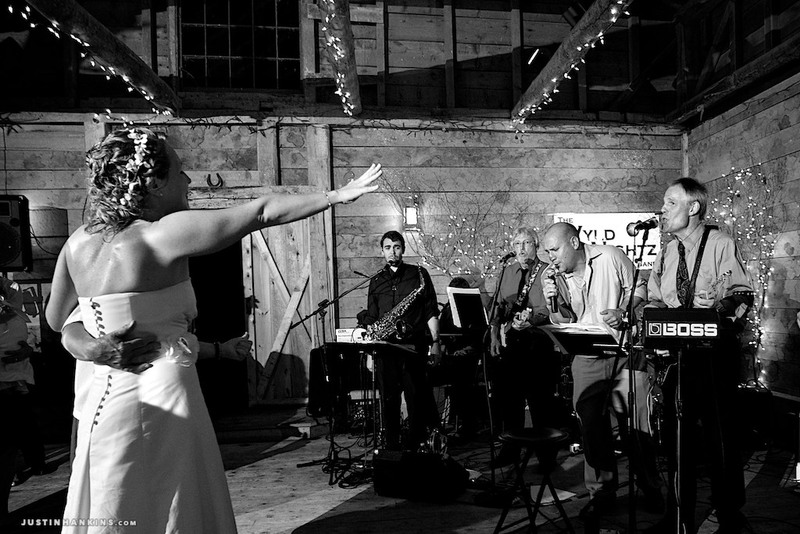 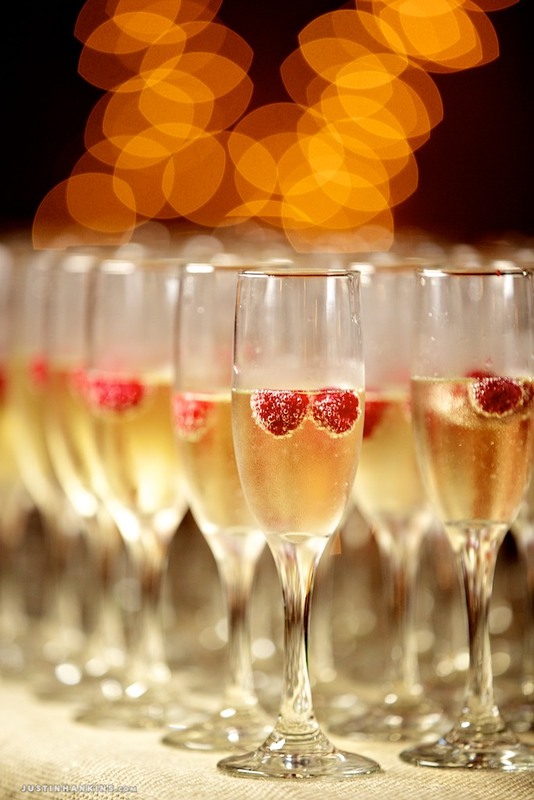 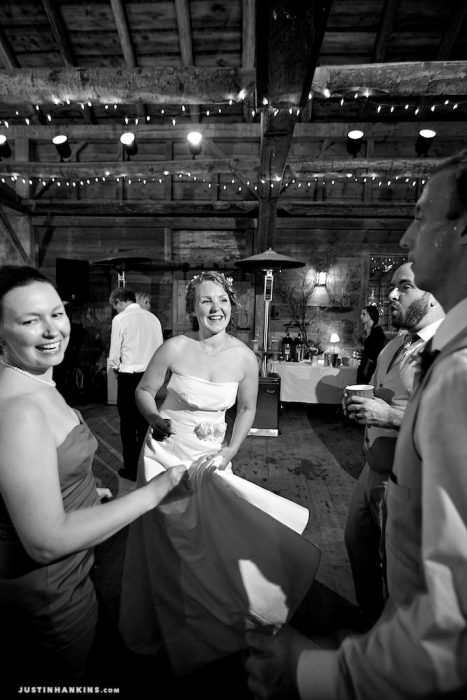 Here are some photographs from Gabrielle and Ted’s wedding in Burlington, Vermont. 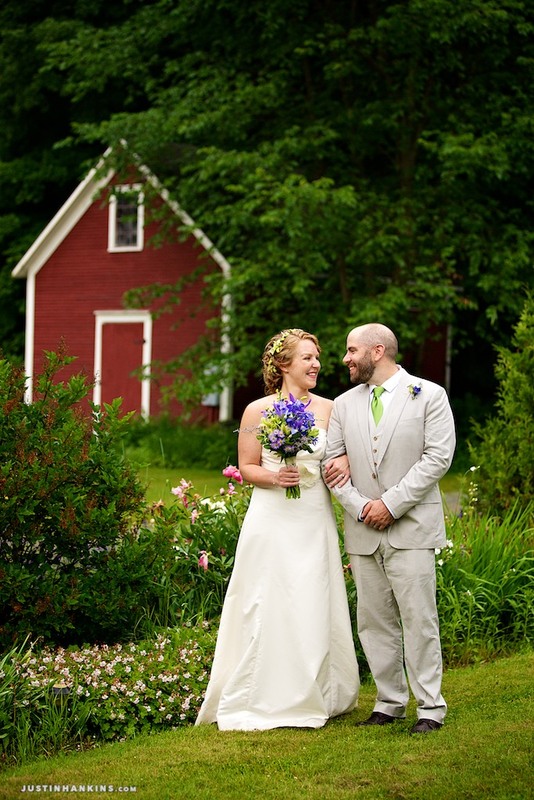 This was my first time visiting the Green Mountain State, and I had a blast documenting all the special moments. 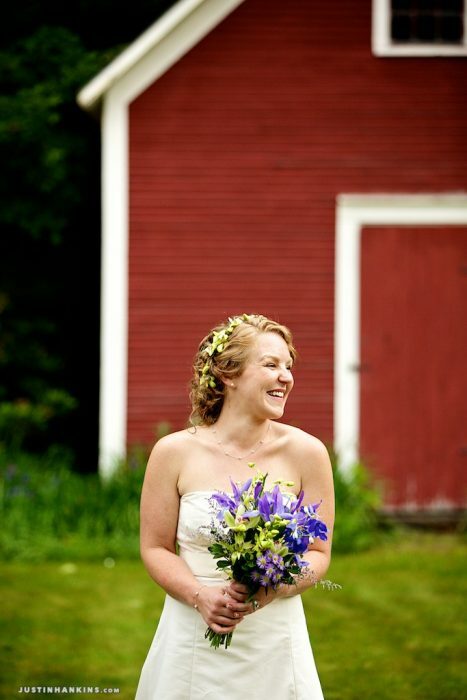 Gabrielle attended Middlebury College before moving on to University of Vermont for med school. 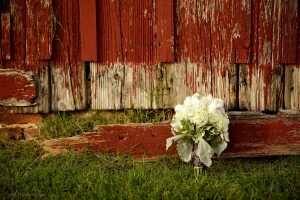 The surrounding area has always held a special place in her heart. 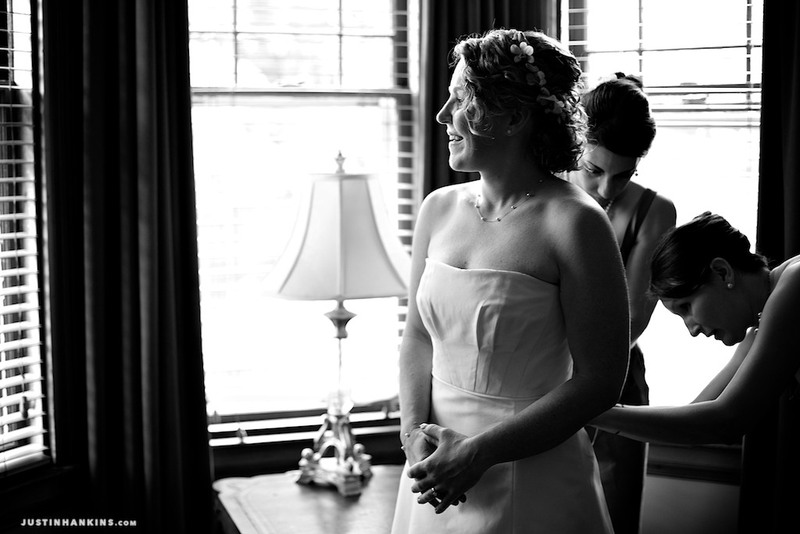 Naturally, Burlington was atop her list when Ted and she began discussing wedding destinations. 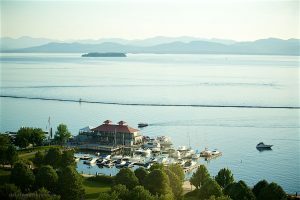 We were treated to a beautiful sunset during the rehearsal dinner cruise along the tranquil waters of Lake Champlain. It was entirely obvious to me, after watching the solstice sun fade behind the Adirondack Mountains as a prelude to the midsummer night, as to why the couple had fallen in love with the location. 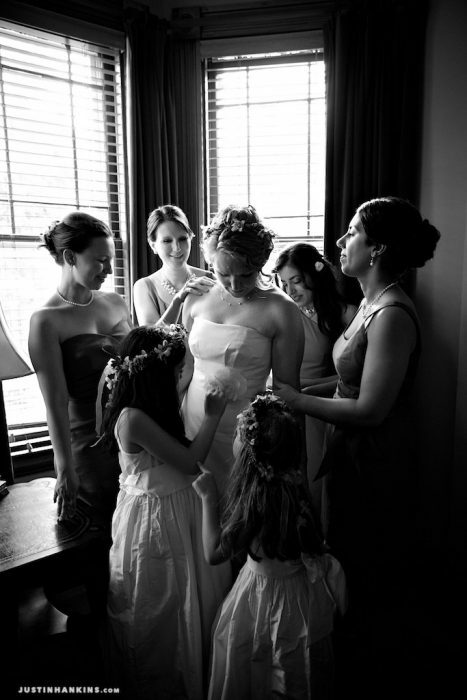 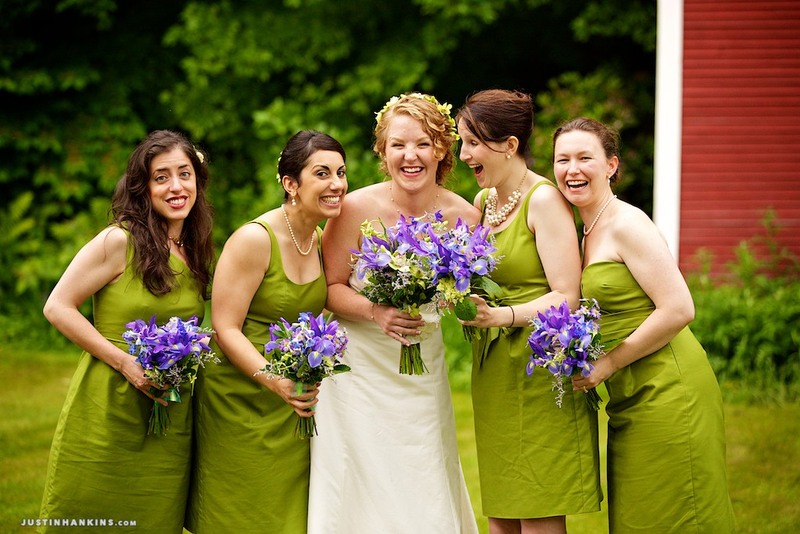 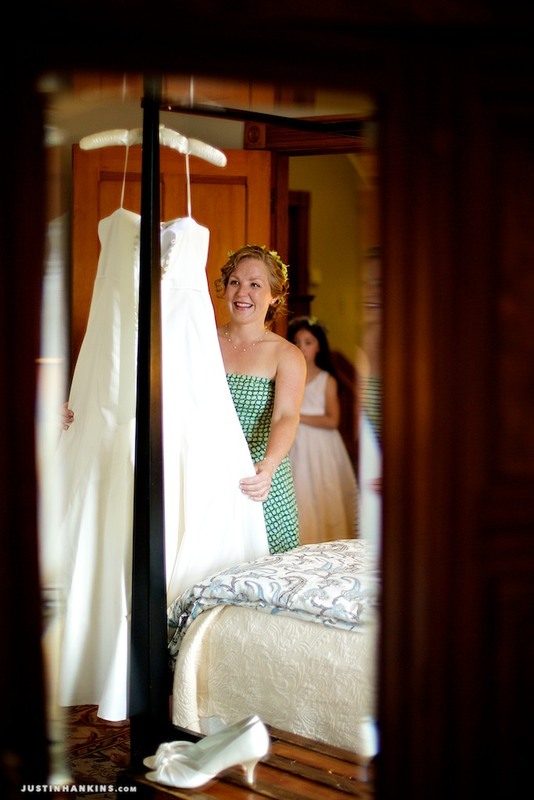 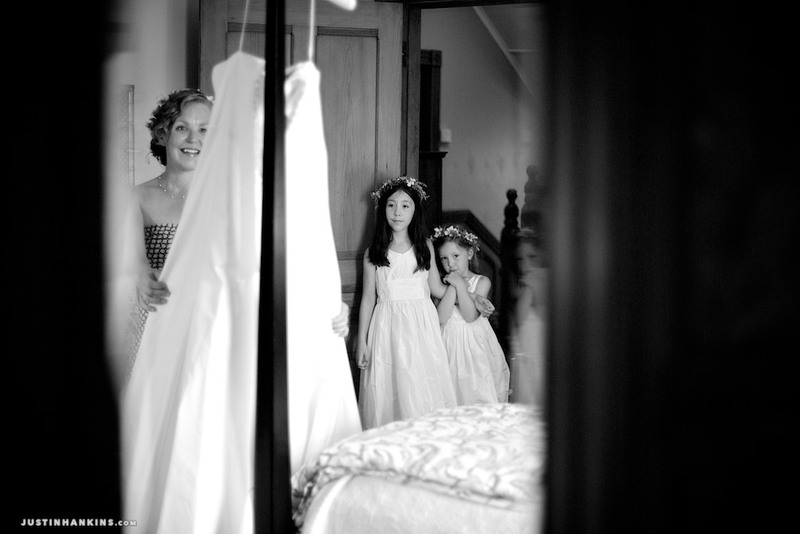 The wedding day began at the Lang House Bed & Breakfast on Main Street, right in the heart of Burlington, where the girls got ready (and deftly ate American Flatbread pizza whilst wearing their dresses :). 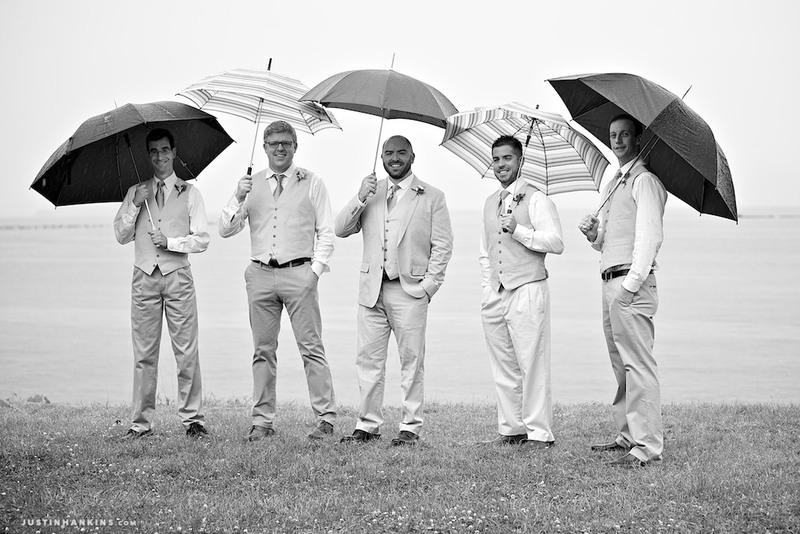 Shortly after, we met up with the gentlemen and headed down to the Waterfront Park for some wedding party photos against Lake Champlain and the mountains. 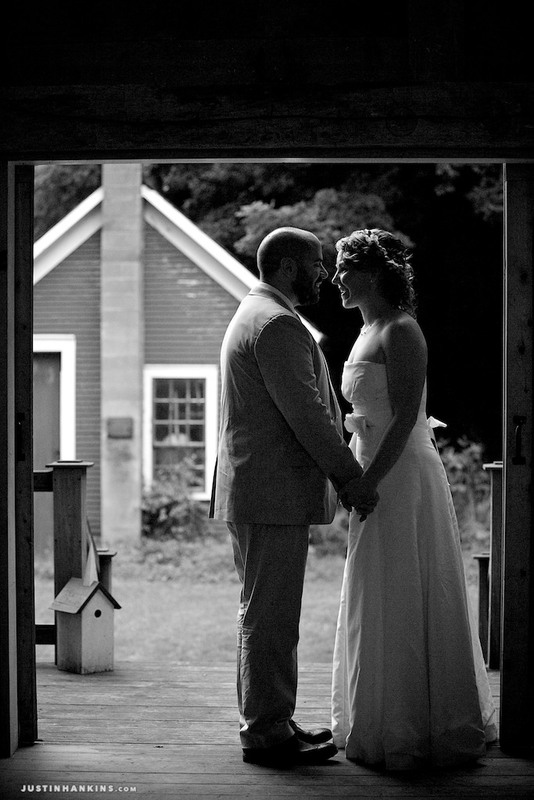 Vermont has been enduring record rainfall this summer, so we felt blessed about the perfect weather the night before. 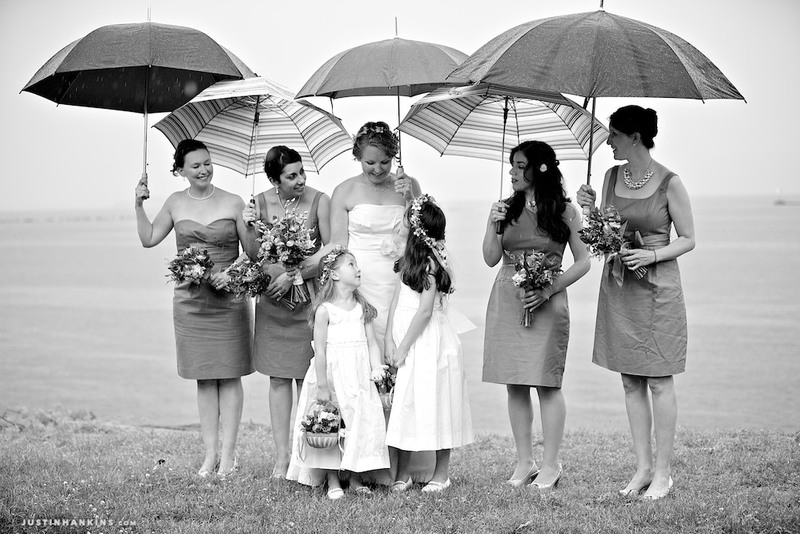 Unfortunately, Mother Nature decided to switch back to rain for the actual wedding day. 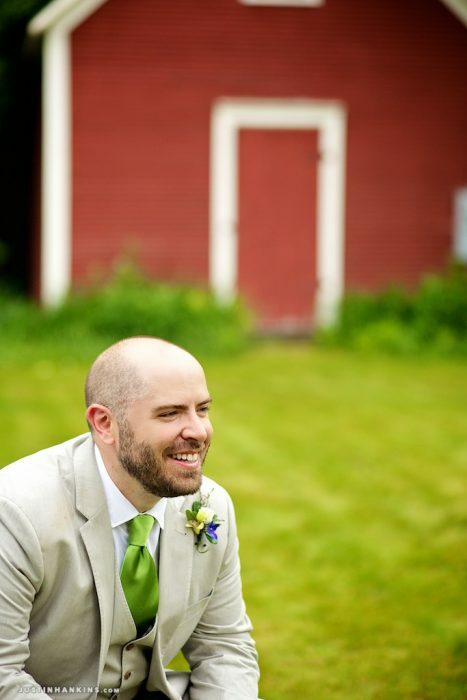 (Bah!) 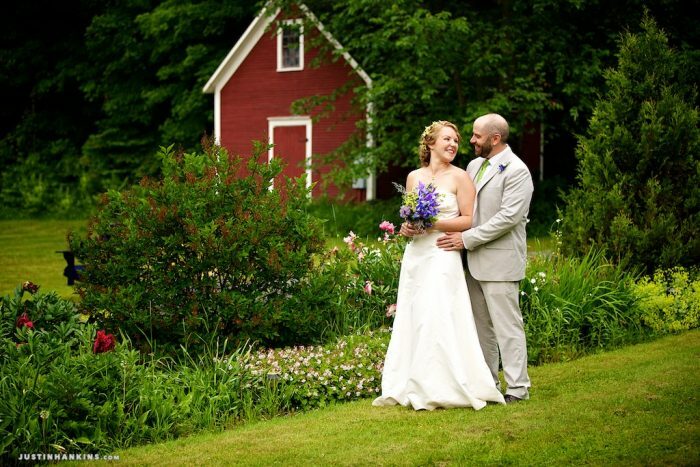 As the storms rolled in, the mountains got a little shy and began hiding behind the fog. 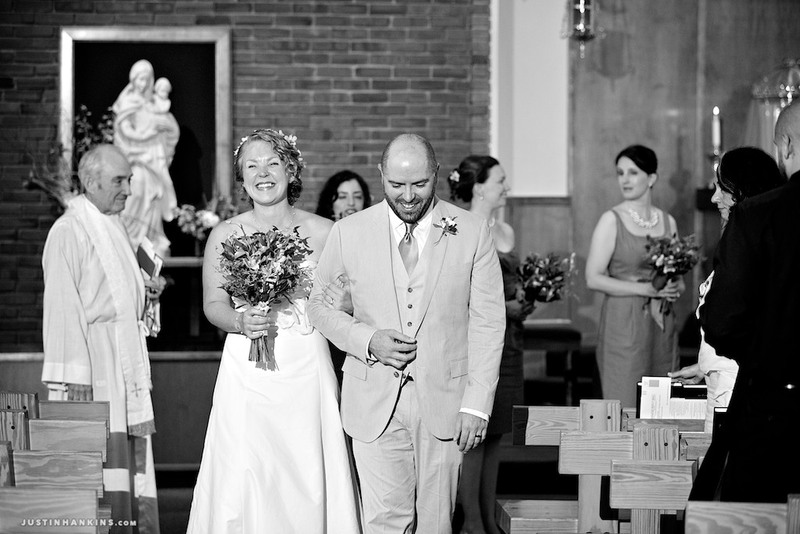 After our waterfront portraits, we made our way to the Catholic Center at UVM for the ceremony. 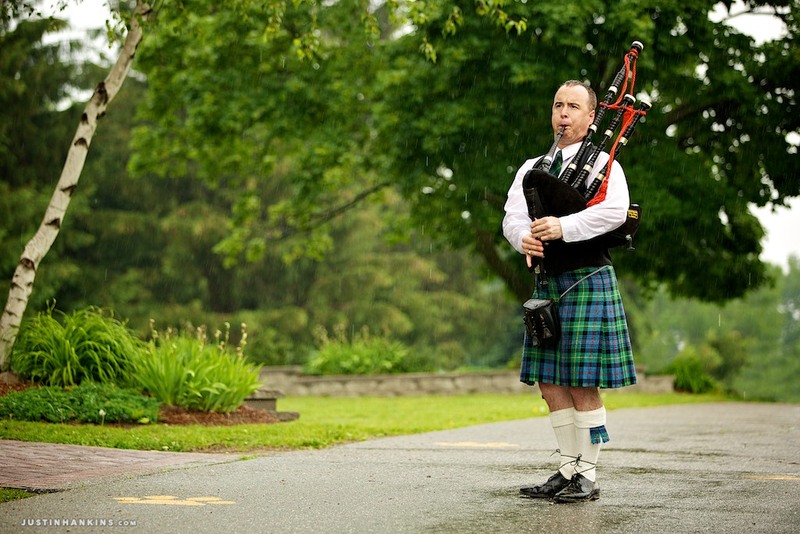 Welcomed by bagpipes, Gabrielle and Ted exchanged vows, rings, and kisses in front of a sentimental, intimate assembly of close family. 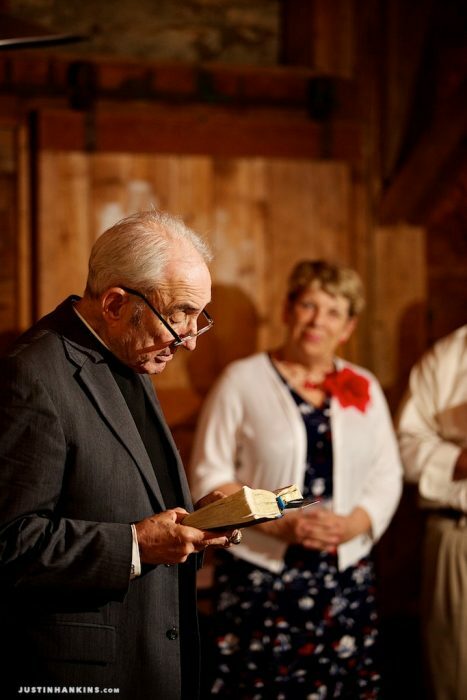 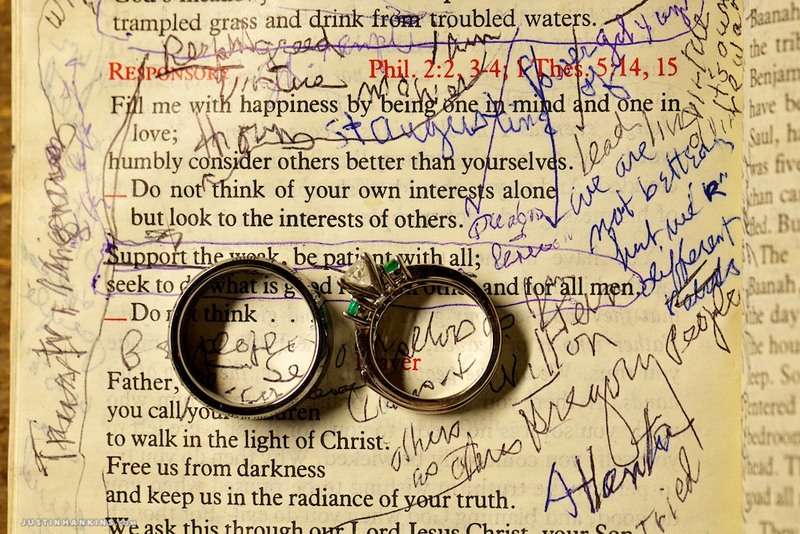 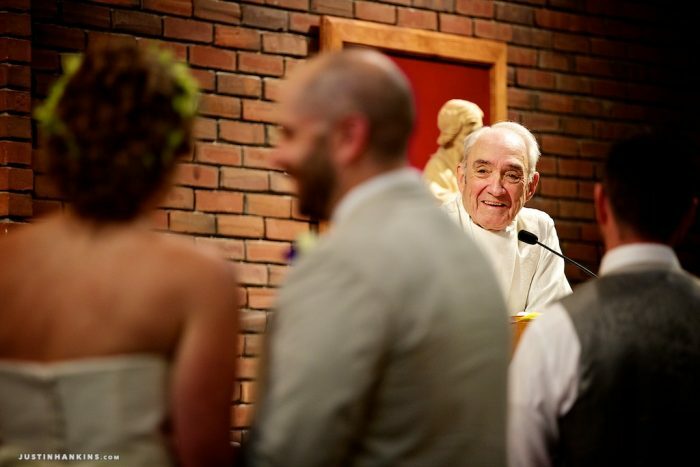 Father Larry Drennan, the bride’s family priest, traveled from Boston to officiate the ceremony. 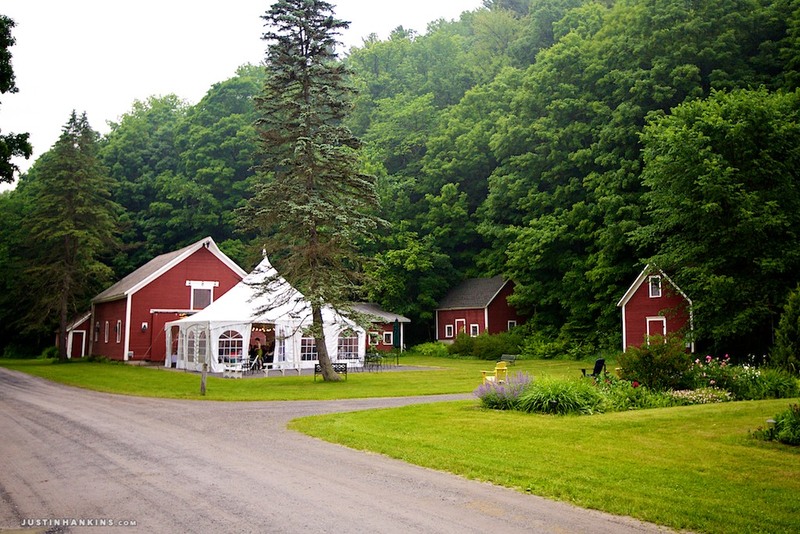 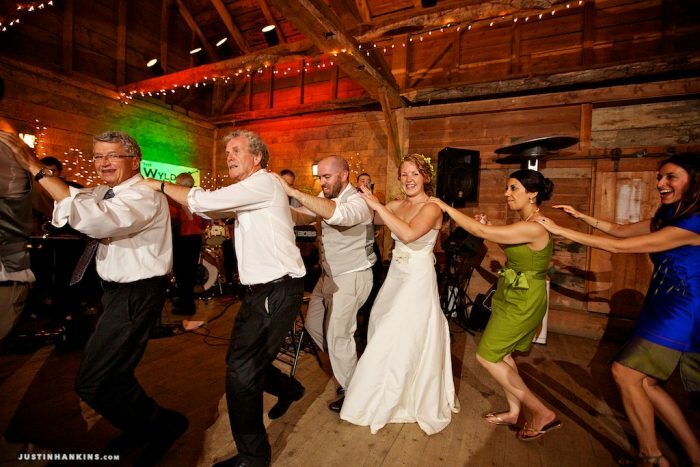 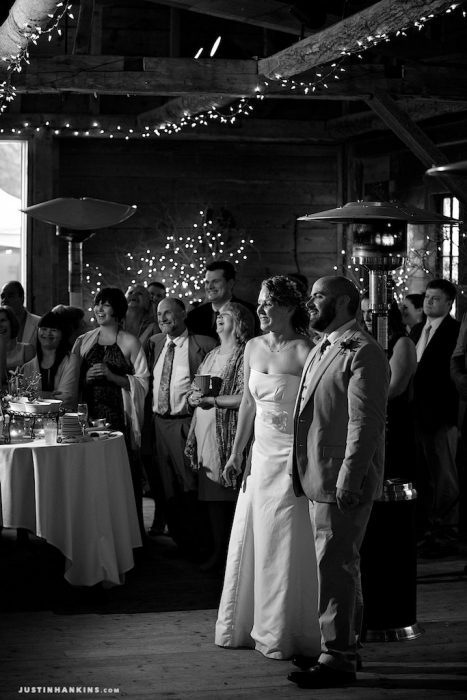 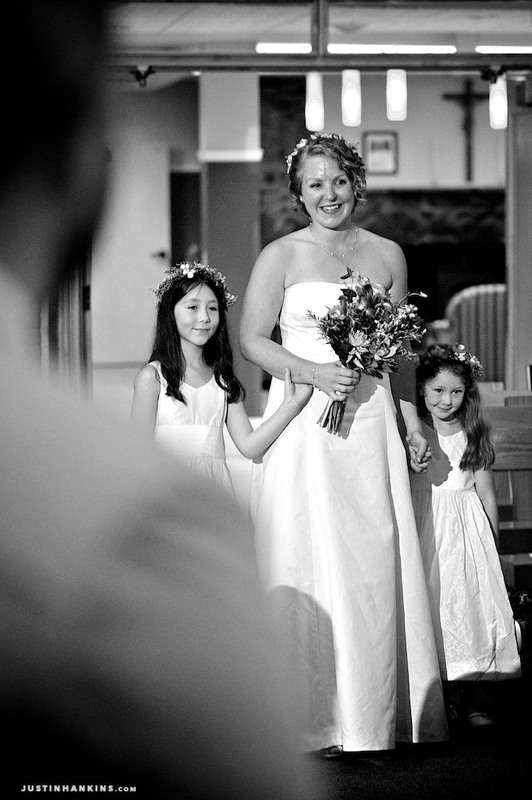 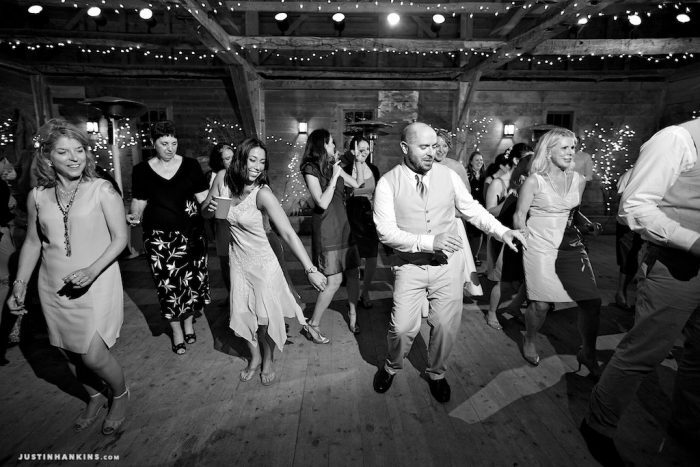 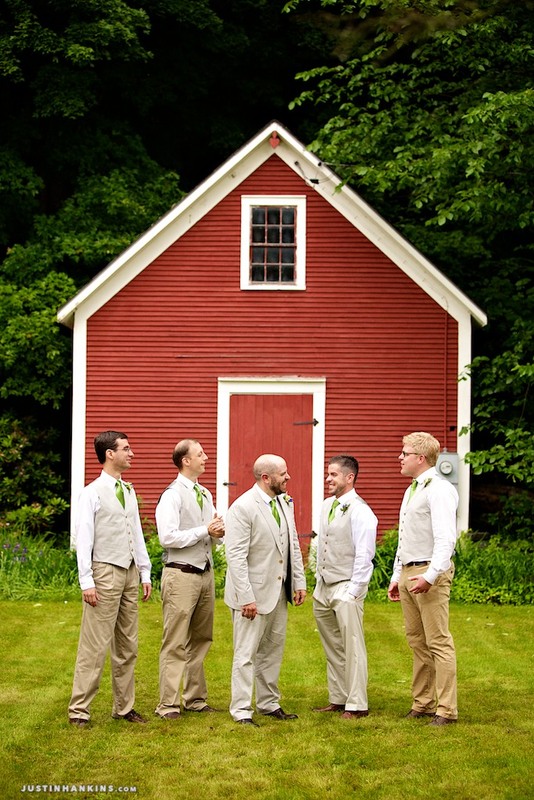 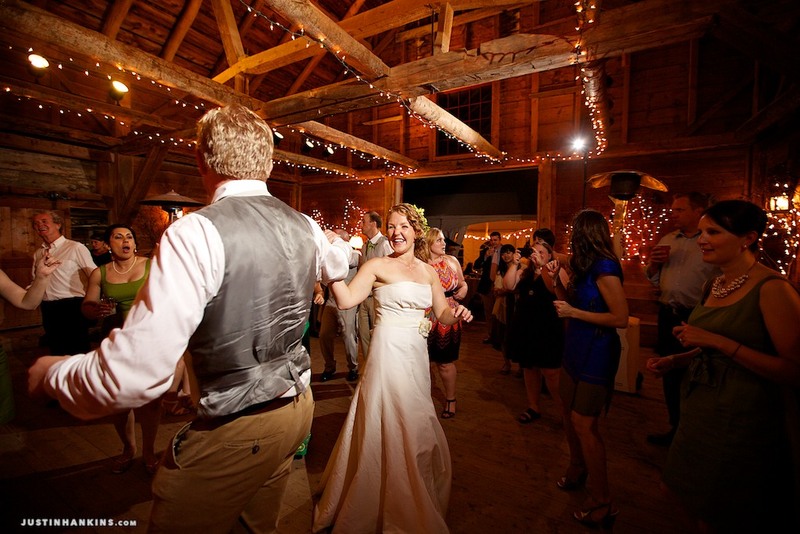 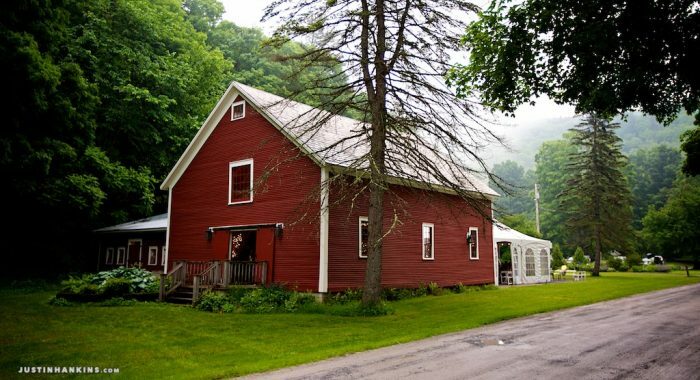 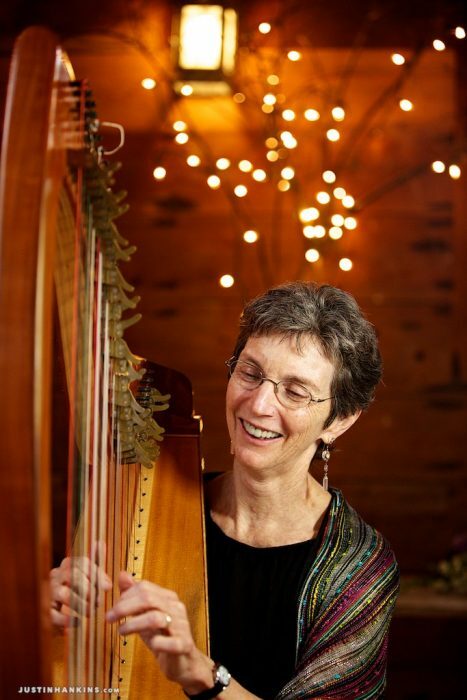 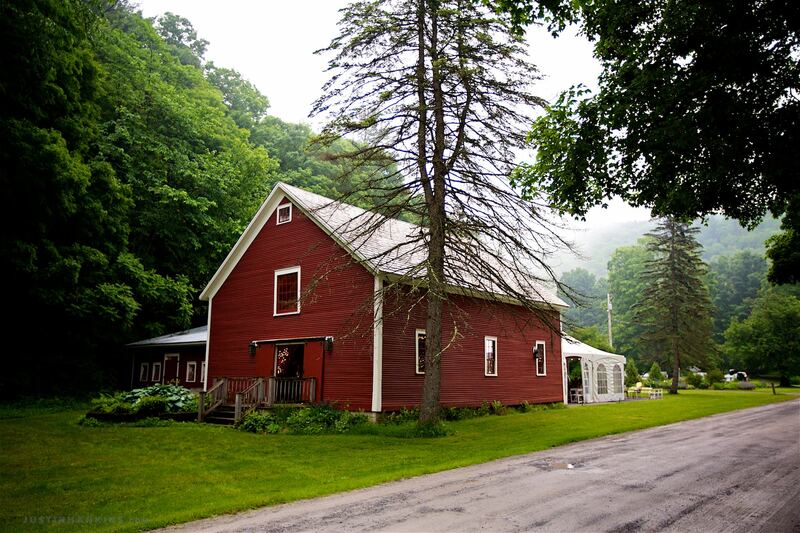 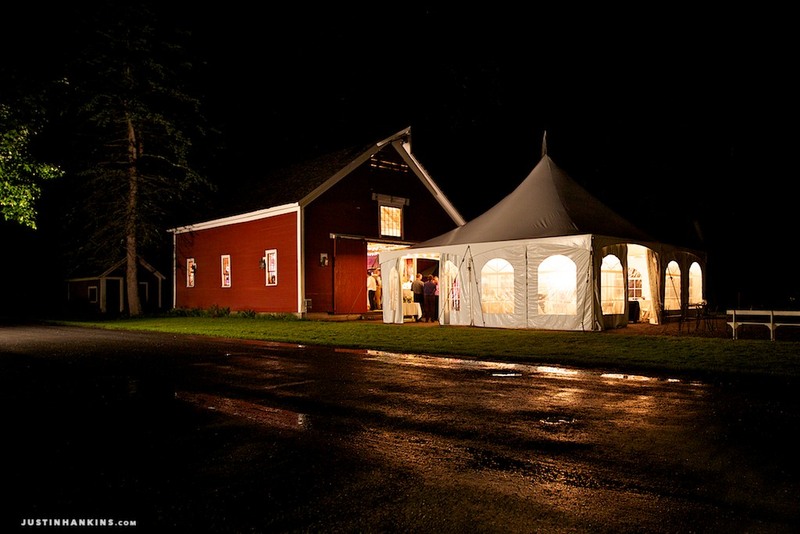 Upon recessing, the couple was followed by their wedding party and guests to the Inn at Baldwin Creek in Bristol, Vermont. 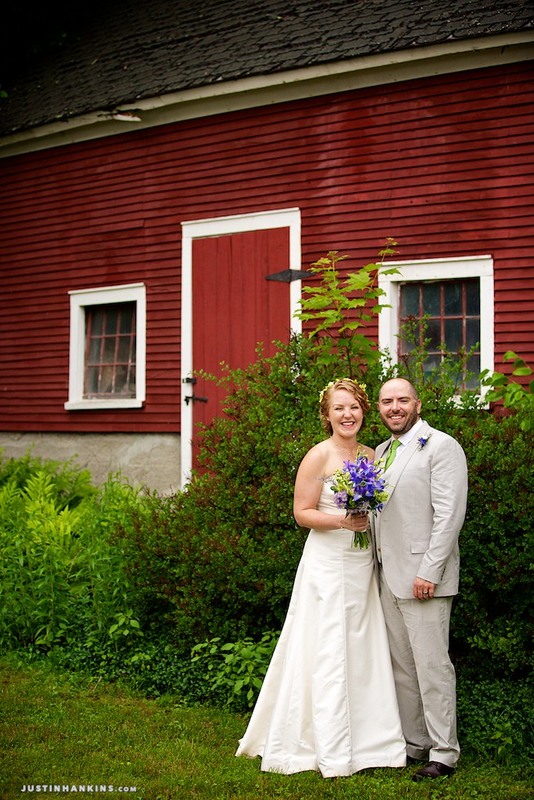 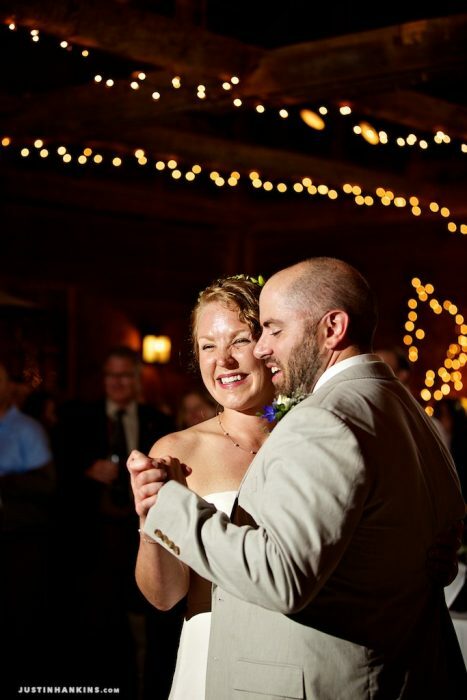 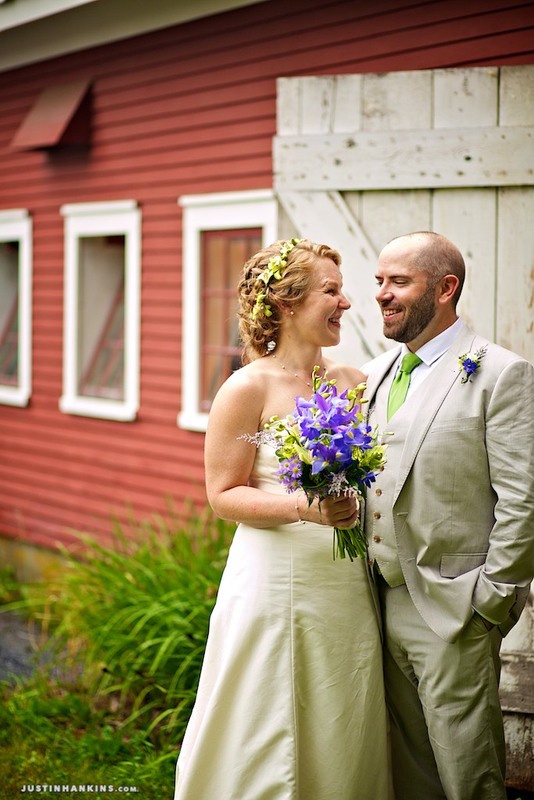 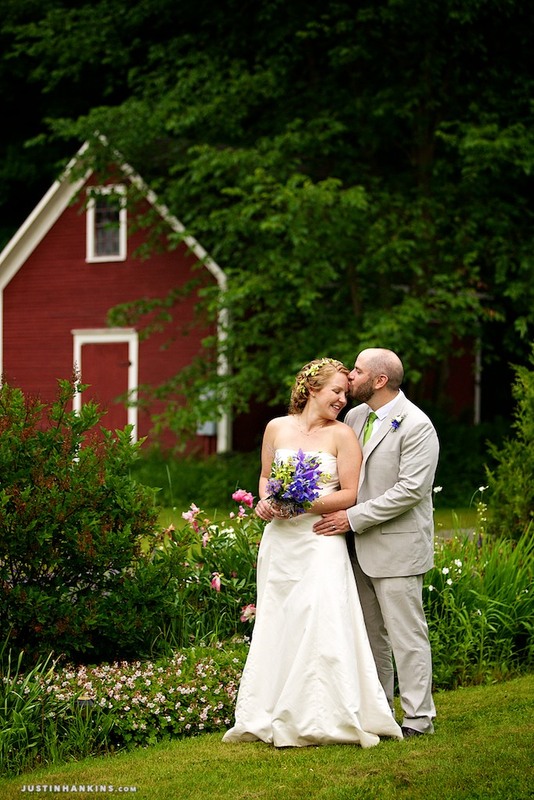 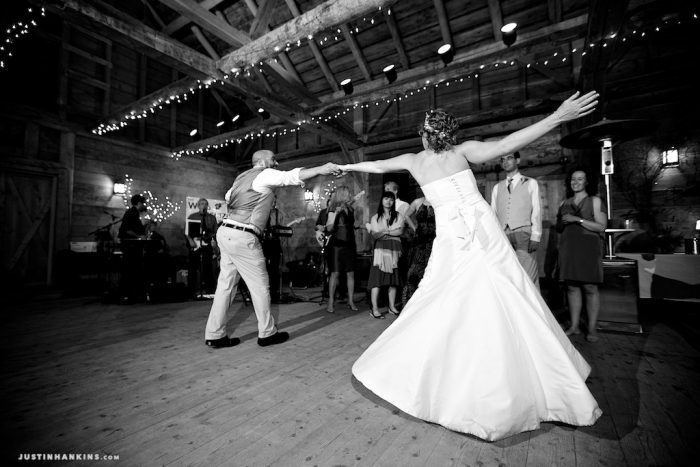 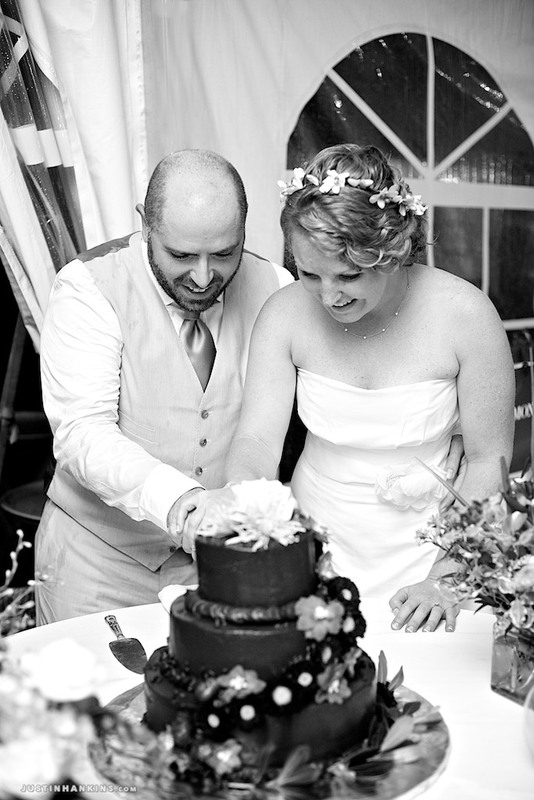 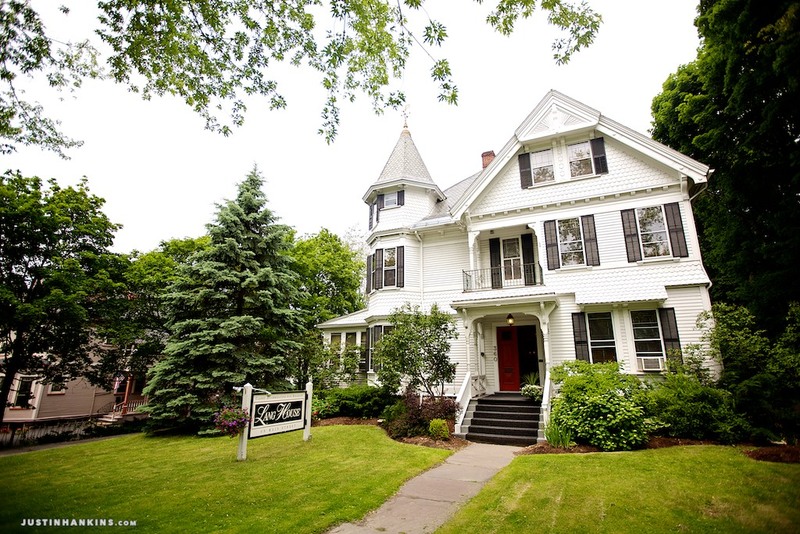 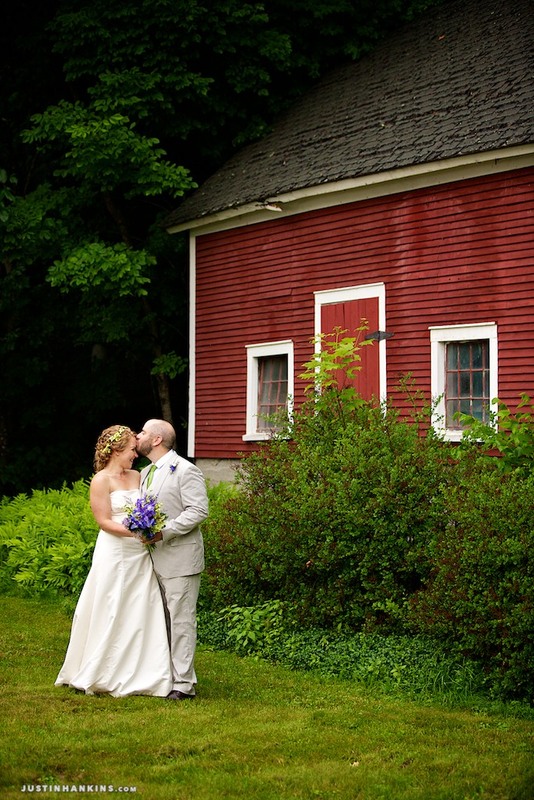 Gabrielle and Ted selected the Inn because they fell in love with both the accommodations and the food many years ago. 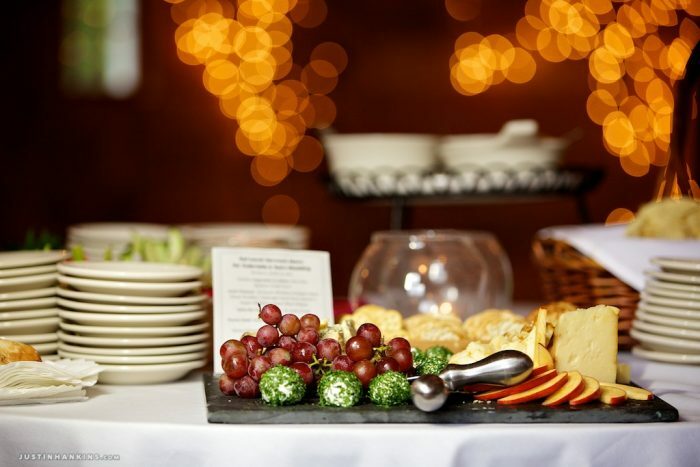 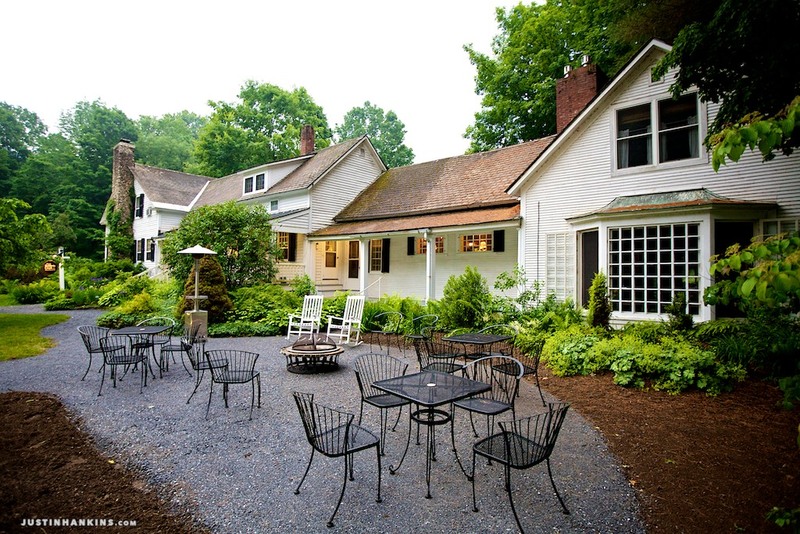 Mary’s, the Inn’s on-site restaurant, is a pioneer in the farm-to-table movement, and Chef Doug Mack delighted everyone with his exquisite, locally-sourced meals. 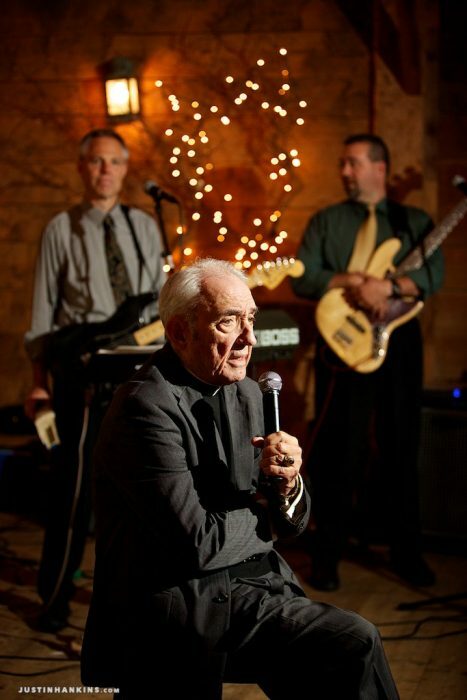 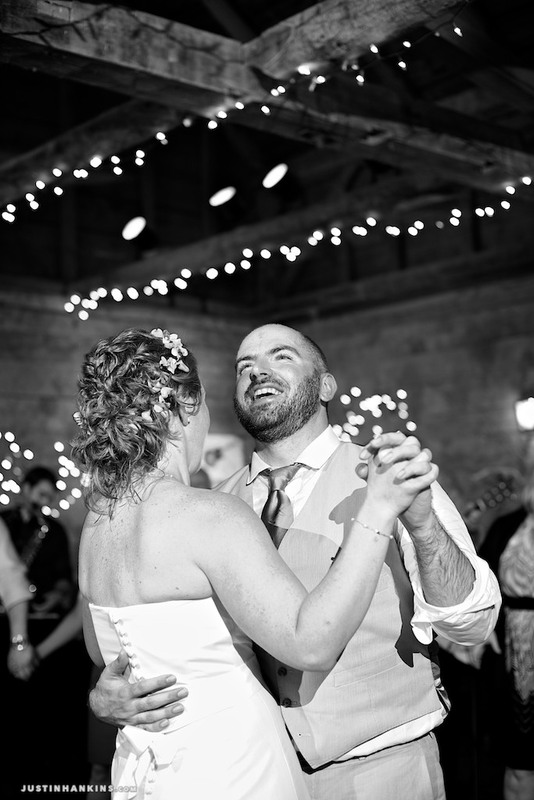 The reception began with a sweet rendition of “What a Wonderful World,” as sung by Father Drennan, which served as Gabrielle and Ted’s first dance. 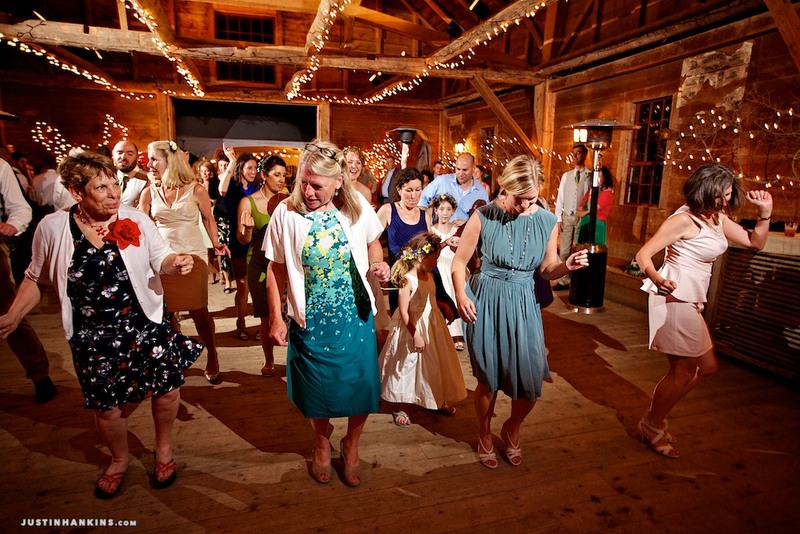 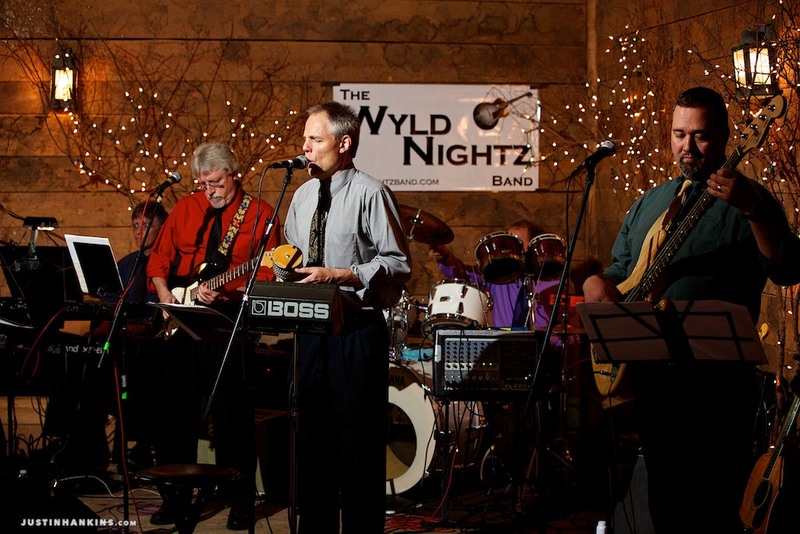 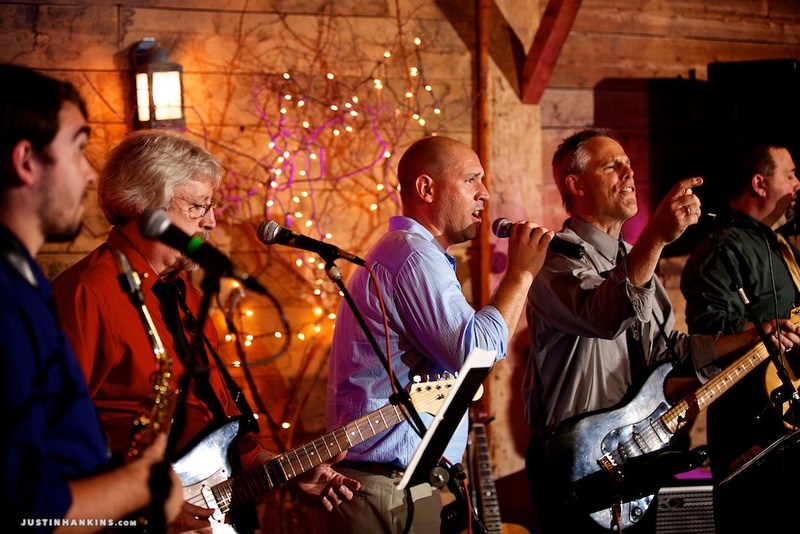 And with a family full of musicians and dancers, it was no surprise that the dance floor was busy all evening — or that the band was frequently supplemented with backing vocals from the couple’s talented guests. 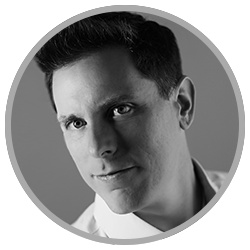 The Inn at Baldwin Creek, nestled in the Vermont mountains, provided one of the most comfortable, intimate settings in which I’ve had the privilege of working. 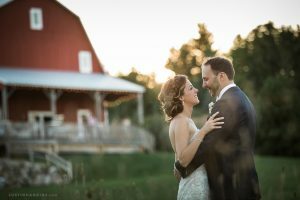 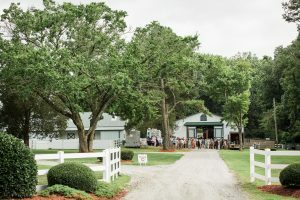 The barn exteriors offered a wealth of rustic chic photo opportunities, and the secluded, natural surroundings made us feel like we were the only people in the world. 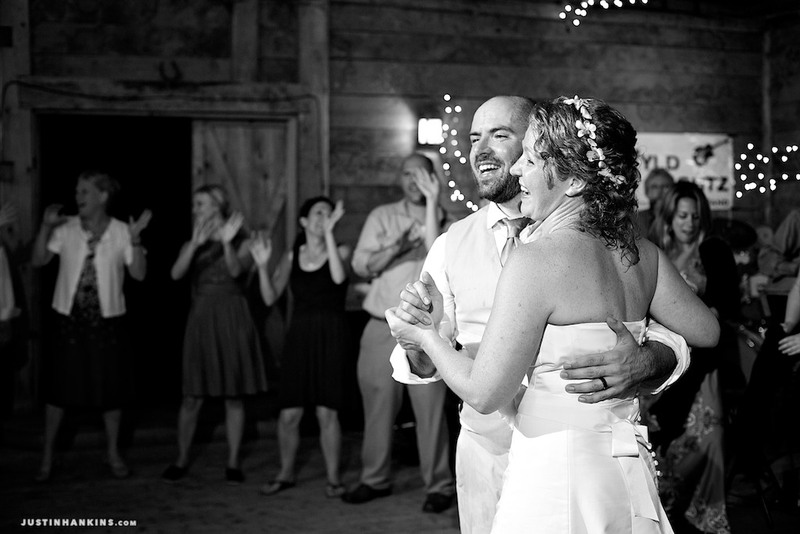 Like so many of the destination weddings I photograph, I’m already anxious to return!